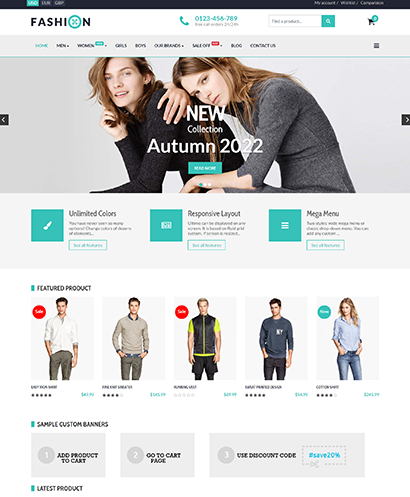 EShop Fashion Pro Template is a responsive Joomla template which is design to work with EShop Shopping Cart extension. It is built with T3 Framework template with Bootstrap 3. You can use this template to setup the website with any types of products that you will sell, not just with Fashion. EShop Fashion Pro template is built with latest T3 Framework and Bootstrap 3. T3 Framework is a powerful template framework from Joomlart. With T3, you can customize the template as the way that you want easily. EShop Fashion Pro template is a fully responsive Joomla template. It looks amazing on diferent devices as smartphones, tablets, and desktops. It works perfectly on different web browswers: Firefox, Google Chrome, IE, Safari, etc. EShop Fashion Pro template support totally of 7 different colors option. You can choose a color that you want for your site. It also supports 2 layout types: full-width and boxed. With the smart settings module on the front-end side, you can alternative between colors and layouts easily and see the change immediately. EShop Fashion Pro template supports both Megamenu navigation system on desktop and Off-Canvas menu on mobile and tablet devices. Having a great organized menu navigation system with menu items to categories, products, manufacturers. It also allows you to load products module and custom images into the menu to make it look great.